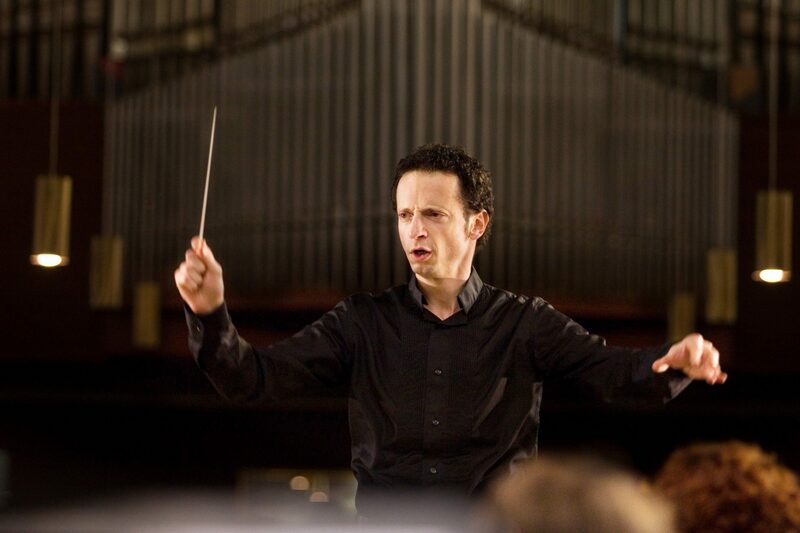 French conductor Michaël Cousteau has established himself internationally as a musician of unusual versatility, conducting operatic and symphonic repertoire ranging from the Baroque on period instruments to contemporary works. In Europe, Cousteau has been invited to conduct the Orchestre National de Lyon, the Orchestre National de Montpellier, the Orchestre Symphonique et Lyrique de Nancy et de Lorraine, the Orchestre de Cannes, the Berlin Landes Jungend Orchestra, the Orchestre Philharmonique du Luxembourg, the Netherlands Radio Kamer Orchestra and the Netherlands Radio Symphony Orchestra. He has furthermore assisted such conductors as Gary Bertini at the Opéra National de Paris, Zoltan Pesko at the Deutsche Oper am Rhein (Düsseldorf), and Emmanuel Krivine at the Orchestre National de Lyon and the Orchestre Français des Jeunes (French National Youth Orchestra). Cousteau regularly appears in China. His guest appearances there since 2012 include concerts with the Orchestra of Wuhan Opera House, the Xiamen Philharmonic Orchestra, and the Shenzhen Symphony Orchestra. In spring of 2016 he conducted the China National Symphony Orchestra at the prestigious Beijing Modern Music Festival and was invited by the Sichuan Conservatory of Music and the Wuhan Conservatory to conduct student orchestras and to give conducting masterclasses. During 2017, he travelled to Taiwan three times to give conducting masterclasses in the country’s most prestigious universities and to lead the Taoyuan New Philharmonic Orchestra in concert. In June 2018, he conducted the Sichuan Philharmonic Orchestra and in November 2018, the Hong-Kong Academy of Performing Arts Symphonic Orchestra. From 2014 to 2016, he has conducted each year at the Sourat Festival in Lebanon, including with the Lebanese Philharmonic Orchestra. Since 2006, with the support from the French Institutes, he has directed the Royal Oman Symphony Orchestra, the Moscow Chamber Orchestra, the Belarus Radio Orchestra and Belarus National Orchestra and the Banatul Philharmonic Orchestra in Romania; the Bangkok Symphony Orchestra, the Philippines Philharmonic Orchestra and the Nusantara Symphony Orchestra of Indonesia. He has appeared regularly throughout his career with renowned instrumental soloists (Nicholas Angelich, Nguyen Bich Tra, Hung-Kuan Chen, Dana Ciocarlie, Nicolas Dautricourt, Laure Favre-Kahn, Ophélie Gaillard, David Grimal, David Guerrier, Sébastien van Kuijk, Marisa Mercade, Michel et Pascal Moraguès, Bruno et Régis Pasquier, Nicolaï Petrov, Suzanne Ramon, Juliana Steinbach, Raoul Sunico, Georges Pludermacher, Cédric Tiberghien, Chen Xi …) and to accompany numerous vocal artists (Jean – Noël Briend, Isabelle Calls, Jean – Pierre Furlan, Sophie Marin – Degor, Cécile Perrin, Nikolaï Schukoff, Maryseult Wieczorek…). Cousteau is known for developing innovative programming that sets canonical and lesser-known composers, including local and Western elements, in conversation with each other to address issues of international import. Additionally, he has a strong interest in resurrecting forgotten musical gems, including on period instruments. His artistic approach leads him to call on artists from the worlds of theater (Nathalie Bécue, Cyril Bothorel, Yann – Joël Collin, Marc Ernotte…), dance (Helena Cueto, Emmanuelle Huynh), and musical theater (Sophie Boucheron, Vincent Heden, Neima Naouri, Marie Oppert, Julien Salvia…). Cousteau is committed to engaging emerging young professional musicians in Paris and abroad. He has regularly conducted the orchestras of the elite Conservatoire National Supérieur de Musique de Paris (CNSMDP), after having founded several orchestras in the Paris conservatories system where he taught conducting. He gives several master classes in Oman, Thaïland, Indonesia, the Philippines, China and Taïwan. Cognizant of the importance of bringing together diverse communities of musicians, Cousteau has served as Music Director of the Orchestre EDF (Electricité de France) since 2010. In this ensemble, amateurs from the business world play alongside professional musicians; together, they perform over ten concerts per season in France’s best concert halls, including Salle Pleyel, the Théâtre des Champs-Élysées, the new Philharmonie in Paris, Toulouse’s Halles aux Grains, Montpellier’s Corum, and many others. Cousteau trained as a cellist and pianist from early childhood. During his studies, Cousteau was honored with awards for conducting, music analysis, orchestration, and music composition at the Conservatoire de Reims and Conservatoire de Paris. He also studied under Julius Kalmar and Karl Osterreicher (Hochschule für Musik, Vienna, Austria) and participated in master classes with Myung Wung Chung (Accademia Chigiana of Sienna, Italy) and Yuri Ahronovitch (Riva Music Festival, Italy). Cousteau was selected by Ton Koopman and Peter Eötvös during the Kiril Kondrashin Master Classes in the Netherlands to conduct the Netherlands Radio Kamer Orchestra at the Beurs van Berlage and the Netherlands Radio Symphony Orchestra at the Konzertgebouw (Amsterdam). Cousteau also holds a master degree in history from the Paris-Sorbonne University.